When data centers need storage expansion that delivers low power and high capacity with high-availability, they rely on the HGST 4U60G2 Storage Platform. This high density, scalable, and cost-effective design includes up to 60 Ultrastar® 3.5-inch drive modules in a 4U enclosure, supports up to 8 hosts with SAS 12Gb/s performance, and delivers enterprise-class serviceability with hot-swappable components. This integrated platform is qualified, tested and certified to support a broad range of HGST HDDs. 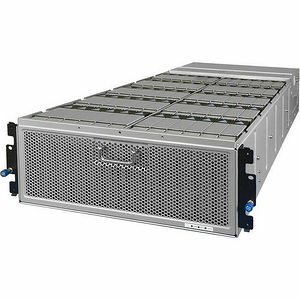 It's available with SAS drives for high-availability (HA) applications, with SATA drives for cost-optimized applications, and can be configured with up to twelve (12) 800GB SSDs to create separate performance tiers within the platform.